Spring is arguably the most wonderful time of year because it brings increased daylight, a more moderate climate, birds, and bees, and flowers…oh my! After being cooped indoors all winter, it’s always a good idea to take advantage of this refreshing change of pace to crack open the windows and tackle your spring cleaning task sheet. Dusting, vacuuming, organized closets, clearing the yard, prepping the garden, airing out rooms. This spring, go a step further and clean your dog supplies. This will keep your home clean and your family and pets healthy and happy. Your dog’s bed and favorite toys suffer through excessive wear-and-tear throughout the year. Think about it: they get slept on, drooled on, chewed, gnawed, dragged through your home and yard, lost under the couch. Over time these items get covered with bacteria. 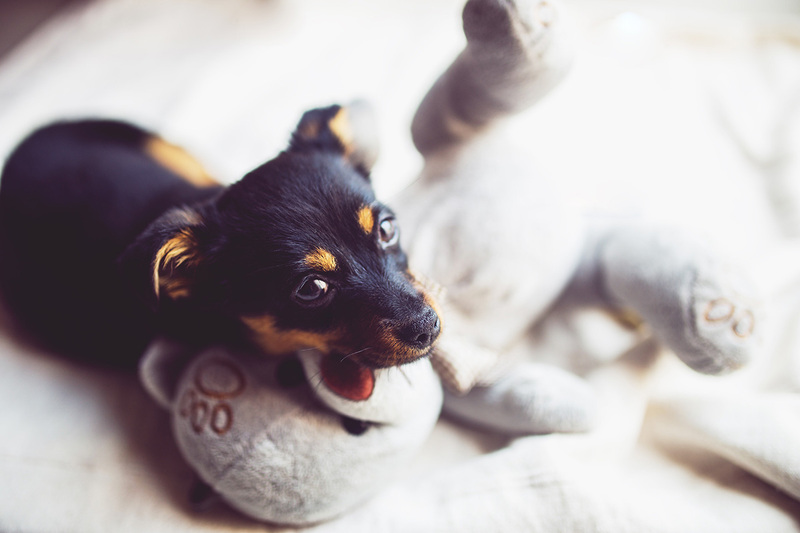 Regularly cleaning your dog’s bed and toys will deodorize unpleasant smells, reduce the number of harmful germs and bacteria, and decrease allergens. Does your dog shed? Whether your dog’s fur is stuck to the back of the couch or your backseats, for those hard to reach areas, wear a rubber glove and run your hand over the cushions to collect fur. Simply roll it between your gloved hands to wad it into a ball as you collect. A fun alternative to rubber gloves is a rubber squeegee. Remove hair, clean off your squeegee, and then wipe down your windows to kill two birds with one stone! Your dog’s food and water bowls see daily action but it’s easy to forget to clean these necessary items. If it’s been a while, pop your dog’s food and water bowls into the dishwasher for a thorough cleaning. Or, for bowls that aren’t dishwater safe, rinse them with hot water and mild dish soap. Another item your dog uses daily that probably needs a good cleaning is your dog’s collar. Simply remove it, let it soak in hot soapy water and a little pet shampoo, then remove, rinse, and let it air dry. Don’t forget your dog needs cleaning too! At Suds N Hugs we provide high-quality grooming services to give your dog the best care from tub to trim no matter its size or breed! Trust our expert groomers to shower your pet with care and attention. Call (716) 759-2030 today to schedule your next visit!